1st Part- groups of three or four. Try for three so they run more. Red players pass the ball amonst each other and move. Green players do the same. Do this for two minutes to get them warmed up. Now they after they pass they must run and touch the cone the furthest away from them before they can be played to again. Make sure when they are making the run they are also looking where the ball is. Now red passes to green and green passes to red and they must still run to furthest cone away from them. 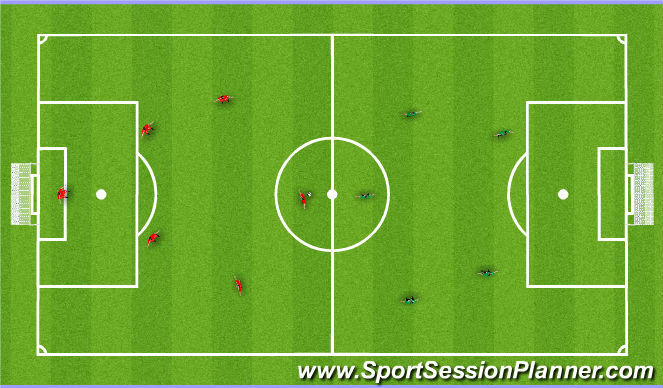 Red players pass ball to green and then switch side. Then that same side green passes them to. So basically red siwtches everytime they pass the ball to green. Make sure the ball is playerd from green to safe side and foot away from the cone. So red players have to use bothe feet. Right on one side and left on the other. Do this for two minutes and switch roles, Have extra balls for bad passes and they have to chase. We want lots of running and movement. 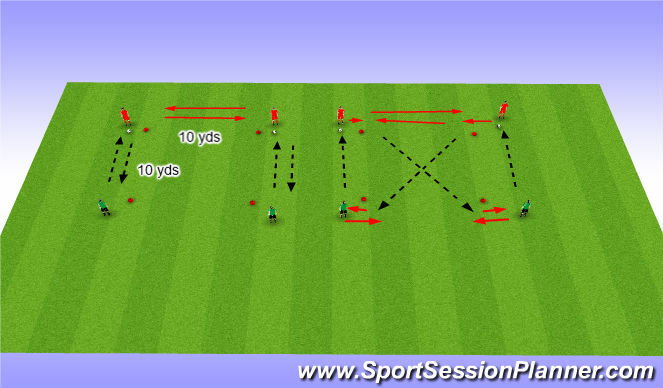 Have the red players start to recive inside past the cone/defender to make a diaginol pass . The green players must move inside to touch ope pass the cone /defender pass the cone outside of the cone. Basically they need to show away from the cone and touch by the cone. Both players must creat alittle space away from the cone and touch away either inside or outside of the cone. Switch roles again after a few minutes. Start with one ball with the double players on the cone. Have the othe players start on the cone. 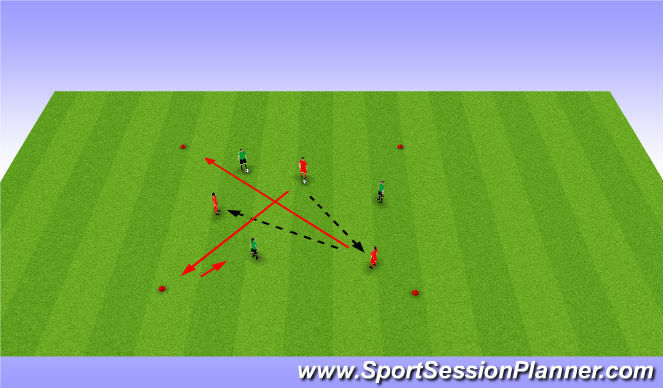 When the player passing to them receives the ball touching open pass their defender that player is to move off the cone to create space to recceive the ball and touch pass there defender. Once the passer has passed they go to the spot they passed to tight to their cone until the ball is going to be passed to them. Basically pass and follow your pass. We are looking to create space away from the defnder once the player that is going to pass them looks up. Switch directions to use both feet. Now add a second ball if you see progress with their passing so that its fast fast and they have to run quickly to the next cone. You will have to have six players for that to work . Two at each ball to start. Play 6 v 6 or 5 v 5 . If the team with the ball shoots and misses or scores they all have to run back to there going and cheer oakville before they can go back and play. The other team can work fast and get the ball forward and score.This will aslo take care of retreat line since they have to run all the way back to goalie.